A couple of days while reading my RSS feeds I noticed an article entitled Daily analysis note: "Upatre" is back to SSL? on the Malware Must Die! blog. During their analysis they mentioned that they didn't solve the obfuscation. I had recently wrapped up an analysis of different obfuscation techniques that Upatre uses. So I thought I'd take a crack at it. After glancing at the sample for a couple of seconds I thought to myself it was a variant of the obfuscated dword XOR sample set. I did a quick educated guess hit F9 in ollydbg and nothing happened. Which is strange because typically Upatre will write the sample to the %TEMP% directory and then try to download it's payload. Instead of the expected activity, I was looking at ExitProcess. At this point my interest was peeked and I wanted to find the anti-debugging...but I didn't care enough to read the assembly code. The code looked somewhat obfuscated. Rather than reversing the obfuscation I decided to take a different route. Ollydbg has a useful feature called Run Trace or rtrace for short. It's great for tracking down anti-debugging or logging changes to registers. It's not a feature I would recommend for tracing over large amounts of code. Creating a PinTool would be a better choice for this type of task but rtrace is good for small jobs. Here are three excellent reads on using Pintool for similar tasks 1, 2 and 3. Rtrace logs the address, thread, instructions, and the register changes. This is very useful for if you want to review how specific registers are changed. The rtrace output can be saved to a file in Ollydbg by selecting View, Run Trace, right-click, and Log to file. Since rtrace logs can be quite large it's best to only trace code that is worth logging. Breakpoints can be used for creating the boundaries of the trace data. Rather than working with rtrace log as a text file I decided to create an ordered dictionary and save it to a JSON using Python. Once the rtrace log is converted to a JSON I can populate the IDB with interesting values. Some values that I thought were interesting were the count of how many times an address got called, the amount of unique register values for an instruction. For example if the following instruction sub ecx, 0D733EFF3h is called X number of times; how many different values of ECX were there? If the set is 1 but the instruction was called 6,000 different times we know it's a static value and not give it another thought. Here is the Python code that I hacked together. print "Error: Could not be found"
# Empty lists are not hashable for sets. # called. If there is an exception it is being run in IDA. To execute the code above pass the output log file to the script, copy the rtrace.json to the working directory of the script and the IDB and then execute the script in IDA. This will give an output as seen below. The C is for Count and S is for Set. Glancing over other functions it is easy to see which instructions are responsible for looping and decoding data. Since the executable only had 17 functions it was easy to identify instructions that were not called and then investigate why they weren't. Notice the fourth and fifth block was not called. This is due to the returned values of what is called at EBX. 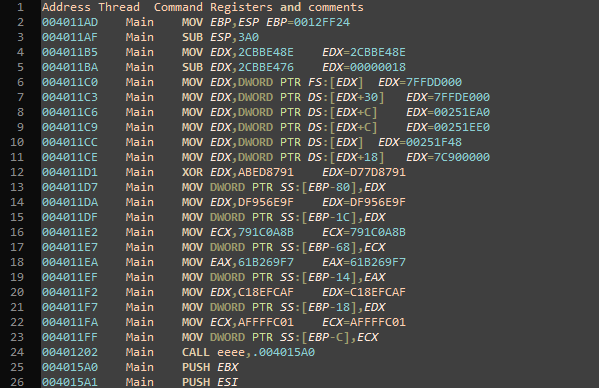 Since rtrace logs all modified register values it is easy to access those values. Included in the script is the ability to print all those values. This can be done by selecting the address and pressing Shift-A. To print the next address called, select the address and the press Shift-S. The arrow is the address of the selected line. Once I followed the address in the output window it lead me to what called ExitProcess. 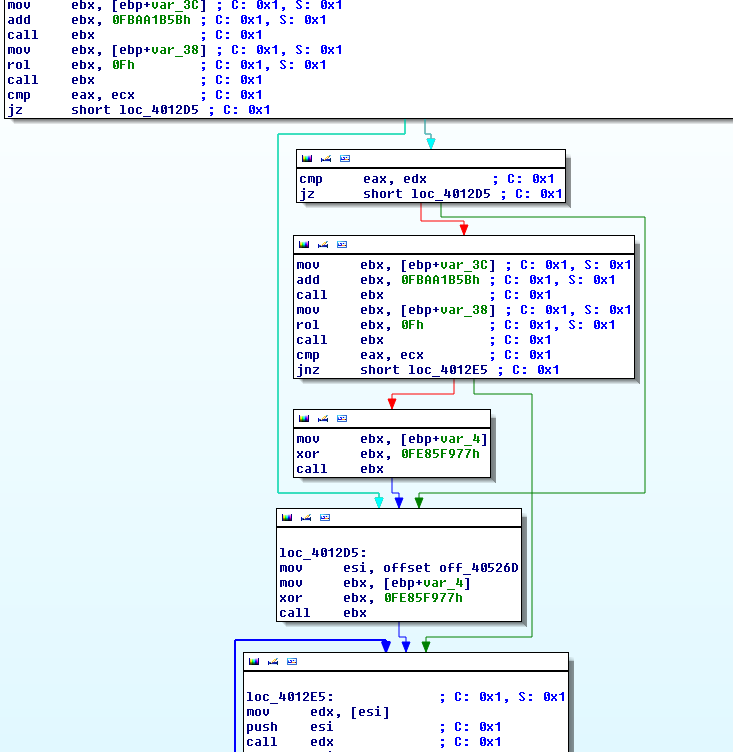 Now all I needed to do was investigate the calls of EBX in the first block of the previous to see what is being checked and patch the ZF flag results to continue execution. What makes this sample interesting (and actually worth reading the code) is Upatre is using an undocumented technique to determine if it is running on a Windows NT 6.0 or higher. I'm unaware if this techniques works on Windows Vista. I have only tested on Windows XP SP3 (NT 5.1) and Windows 7 ( NT 6.1). 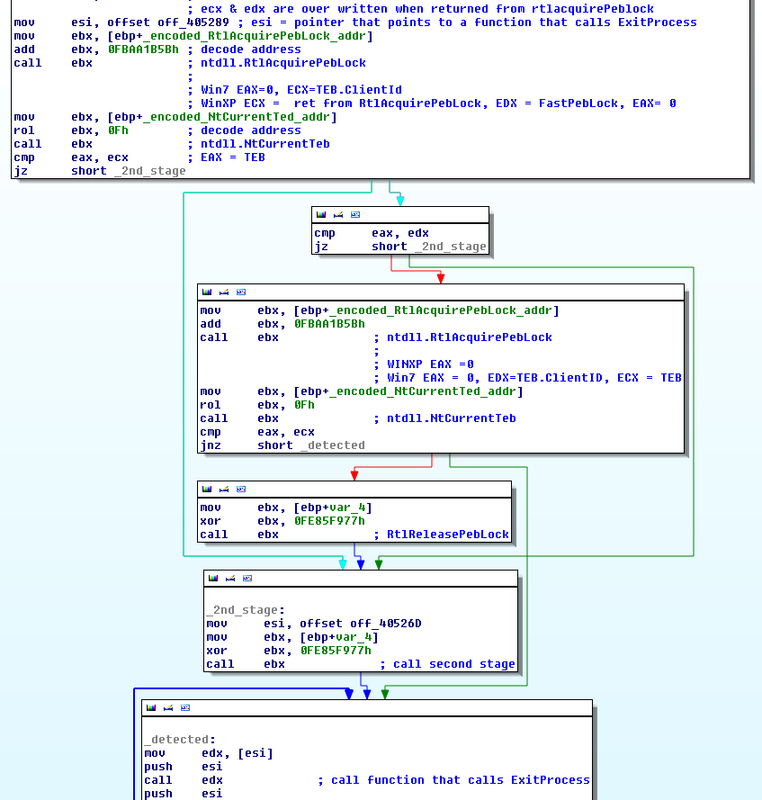 The malware calls RtlAcquirePebLock and NtCurrentTeb twice. On Windows XP when RtlAcquirePebLock is called the first time ECX, EDX and EAX is over written. ECX will be the return address of RtlAcquirePebLock, EDX will be the address of PEB FastPebLoclk which is a pointer to _RTL_CRITICAL_SECTION and EAX will be zero. On the second call only EAX will be over written. On Windows 7 when RtlAcquirePebLock is called EAX will become zero and ECX will be equal to the Thread Information Block (TEB) ClientId. On the second call to RtlAcquirePebLock EAX will be zero, EDX will be the TEB CliendId but ECX will be equal the the TEB. On the second call to RtlAcquirePebLock if ECX is equal to TEB or the return of NtCurrentTeb the sample is running on NT 6.0 or higher. The changes in the return values are caused by the difference in how RtlAcquirePebLock calls RtlEnterCriticalSection. In Windows XP RtlEnterCriticalSection is called by being passed a pointer from PEB FastPebLockRoutine. 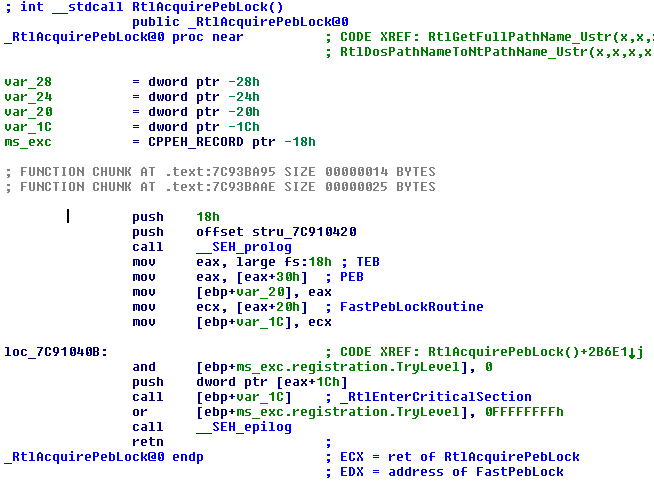 Since the PEB is writable from user mode the FastPebLockRoutine, it can be over written to cause a heap overflow. See Refs 1 and 2. Below we can see the difference between XP and Win7 for RtlAcquirePebLock. Pretty interesting technique for avoiding Windows XP. Thanks to Hexacorn for help and feedback. 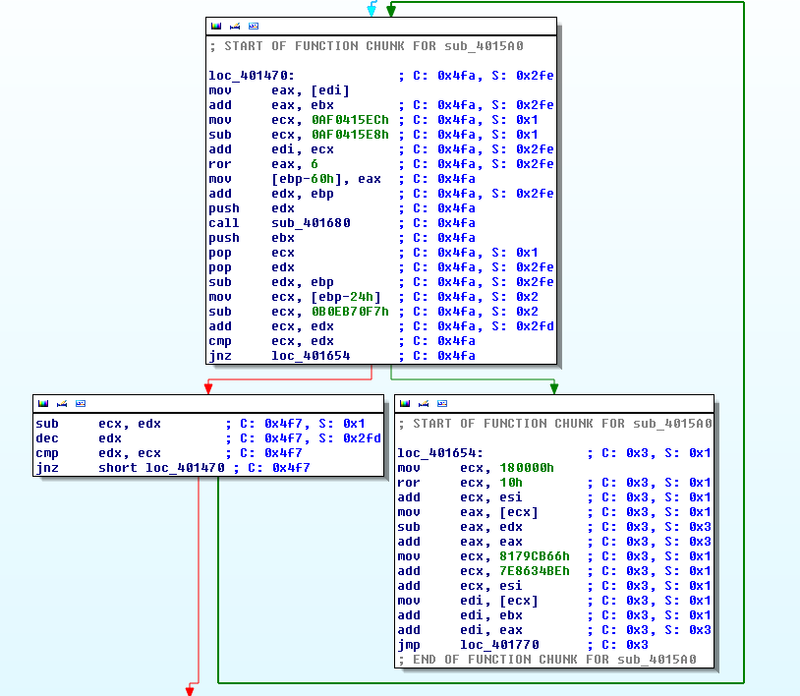 If I wanted to continue executing the malware I would either need to patch the return of the second call to RtlAcquirePebLock or patch the comparison. Please feel free to send me any feedback, criticism or notes via email (in the python code), hit me up on Twitter, or leave a comment. Cheers.